Pride is the attitude that says “I’ve worked hard for everything I got – nobody gave me anything.” If you are smart or successful, you will take the credit. This type of prideful attitude attributes all of your successes to no one other than you. Pride hinders one from realizing that every good and perfect gift comes from God. (James 1:7). 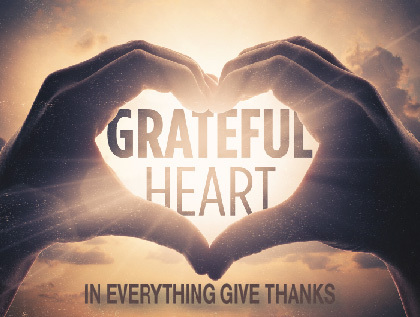 A person who has a very critical spirit finds it very hard to be grateful and thankful. When God does not move fast enough or according to our timetable of how things ought to be occurring in our life, we tend to become impatient and take matters into our own hands. Impatience can lead to complaining even about God not blessing us when we feel it is our time to be blessed. Instead of being thankful, we mumble and grumble about our life and circumstances. If we learn to wait on God and be patient, we can allow God to work out His purposes in our life. Beloved, the bottom line is we must learn to give thanks in every situation. We have been so blessed with so much but yet we give thanks so little. Instead of thinking about how little you have or about how different your life can be if you had this or that; learn to count up what you do have and give God thanks. Happy Thanksgiving to you and yours and let me take this opportunity to thank you for being avid readers of this column. Where is the Black leadership?